Sweet Soul is a Miami label known to Northern soul fans for Billy Wells’ stomping “This Heart These Hands”, even though the sensitive doo wop flavoured flip “Ten To One” is by far the better side. 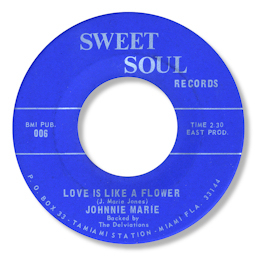 But this 45 by the very obscure Johnnie Marie (Jones) on the same label seems to have escaped everybody’s notice. And that is a pity as it is a very good ballad indeed. I like the guitar figure (Little Beaver??) and the subdued horns, but best of all is Johnnie’s demonstrative and confident vocal. Definitely one to look out for.